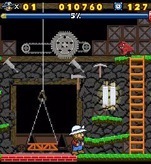 Miner 2049er has the distinction of being the most difficult mobile game I've ever played. I'm not the kind of gamer to shy away from a challenge, even a stiff one, but even I have my limits. Although I enjoyed my overall experience with the retro platformer, its difficulty ultimately negatively influenced my final opinion (and my score), which is a first, for me. The game is actually a remake of the early 80s classic of the same name. Developer Magmic is quick to point out that the original was named "Game of the Year" by Electronic Games way back in 1984. The goal then, as now, was to step on every square inch of floor space in each of the radioactive mine's 10 levels. Even in the beginning this isn't a particularly easy task, but it gets downright devilish later on. Touching an enemy means instant death, unless protagonist Bounty Bob picks up a piece of mining equipment, which gives him a small window of time to turn the tables and dispatch baddies. Although the game looks & feels like a platformer, I get the feeling that each level was also designed to be unraveled somewhat like a puzzle. Each level has a time limit, which often proves to be a bigger foe than the enemies or obstacles themselves. Since every bit of floor has to be stepped on, and since enemies can only be dispatched during the short times Bob is powered up, it becomes all about finding that one perfect path through the level that will allow you to touch all the floorspace before time runs out. Magmic got a lot right. Like most recent retro mobile releases, the release includes a pixel-perfect port of the original, as well as an updated release that contains new stages and much more attractive visuals. Online leaderboards have been included as well, and do a lot to enhance replay value. Unfortunately the package misses the mark in a couple fundamental ways, as well. It's unacceptable for any level-based retro port to not include an option to save your progress, or begin from the last level reached. Miner 2049er may include 10 retro and 10 modern levels, but the vast majority of mobile gamers will only see probably levels 1-4 or so, and will be stuck playing those same levels over and over due to this oversight. Additionally, the difficulty could have used some tweaking. The classic mode is what it is and I can't knock Magmic for keeping the port faithful, but there's no reason for the modern mode to be just as punishing. 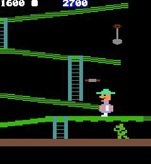 I didn't make it past the first level the first few times I played. You die when you touch any enemy. You die if you fall off any ledge even slightly more elevated than Bob's jump height. You die when you run out of time because you missed one tiny area of floor just a couple pixels wide and can't find it. Magmic eventually gave me a level-select cheat code (at the main menu enter 213 782 6861 - Big Five Software's original phone number) which helps tremendously. Without it I never would have been able to see the second half of the game. It's a feature that still should have been standard, however. My opinion of this classic platformer is undoubtedly influenced by the fact that I don't have fond oldschool memories with it like I do with, say, Burger Time. If you liked Miner 20+ years ago, you'll like it now. If you missed it the first time around, you might dig it now, but tread cautiously.